"Dogwood" 14 inch table lamp with a "Lummus" base with broad ribs, model #333. 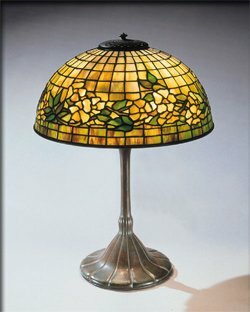 "Dogwoods" are a popular design with Tiffany collectors. This example has the more common colored gold/amber and green glass colors.